In the first of three lessons on listeners we learn about context listeners. Before we get started perhaps we should define what a listener actually is. A listener allows us to receive event notifications when a context, request or session state has been altered; whether it be when the lifecycle of the scope in question has changed, or one of the attributes within that scope has been added, removed or replaced. Knowing when for instance your application's context is loaded is extremely useful, you may wish to create some objects when your application is deployed or keep a log of changes to your application's attributes. By implementing the appropriate interface for that listener we can write code to deal with an event when it happens which is a very powerful reactive tool to have in the armoury. There are two context listener types we can use, these being javax.servlet.ServletContextListener and javax.servlet.ServletContextAttributeListener. When implemented, these types will trigger from the javax.servlet.ServletContextEvent and javax.servlet.ServletContextAttributeEvent event types respectively. The context listeners and their related event types are summarized in the table below, use the links in the table to go to more detailed explanations of each interface and event type. ServletContextListener ServletContextEvent You want to know when a context has been created or destroyed. ServletContextAttributeListener ServletContextAttributeEvent You want to know when a context attribute has been added, removed or replaced. We look at each context listener and context event type in more detail in the following sections and finish our discussion of context listeners with some code to see the various components in action. We implement the ServletContextListener type when we want to receive notifications about changes to the servlet context the web application is part of. This allows users of the interface to know when a context is about to be initialized or destroyed. This type of notification can be useful for any pre-initialization we need to do in the first instance and for any housekeeping required in the second. The two methods within the ServletContextListener interface are shown in the table below. Click the links in the table below to go to code examples of the implemented methods. void contextInitialized(ServletContextEvent sce) Receive notification that the web application initialization process is commencing. void contextDestroyed(ServletContextEvent sce) Receive notification that the servlet context is about to be shut down. ServletContextEvent is the event class for notifications about changes to the servlet context of a web application and consists of a single method which is used to return the ServletContext object for the event that fired. This class is also the parameter input for both of the ServletContextListener methods we need to implement and is how we are alerted to changes when the event is triggered. The only method within the ServletContextEvent class is shown in the table below. Click the link in the table below to go to a code example of this method. ServletContext getServletContext() Return the ServletContext that changed. We implement the ServletContextAttributeListener type when we want to receive notifications about changes to the attribute list of the servlet context the web application is part of. This allows users of the interface to know when an attribute has been added, removed or replaced. This type of notification can be useful for logging, messaging and scheduling. The three methods within the ServletContextAttributeListener interface are shown in the table below. Click the links in the table below to go to code examples of the implemented methods. void attributeAdded(ServletContextAttributeEvent scae) Receive notification that a new attribute has been added to the servlet context. void attributeRemoved(ServletContextAttributeEvent scae) Receive notification that an existing attribute has been removed from the servlet context. void attributeReplaced(ServletContextAttributeEvent scae) Receive notification that an existing attribute has been replaced within the servlet context. ServletContextAttributeEvent is the event class for notifications about changes to the attribute list of the servlet context the web application is part of and consists of two methods which show the key/value pairing of the attribute in question. This class is also the parameter input for all of the ServletContextAttributeListener methods we need to implement and is how we are alerted to changes when the event is triggered. The two methods within the ServletContextAttributeEvent class are shown in the table below. Click a link in the table below to go to a code example of the method. java.lang.String getName() Return the name of the attribute that has changed on ServletContext. java.lang.Object getValue() Returns the value of the attribute that was added, removed, or replaced. If the attribute was added, this is the value of the added attribute. If the attribute was removed, this is the value of the removed attribute. If the attribute was replaced, this is the old value of the attribute. We will keep the idea simple so you can see how both the ServletContextListener and ServletContextAttributeListener listeners are implemented and what else we need to do to get our listeners working. It is not an intention of this tutorial to go into details about event handling, although if you are interested it works in the same way as Swing for example. For more details on event handling you can find information on my Java6 Tutor site at Swing - Event Handling. What we are going to do for the example is set up two listener classes for our context listeners and a simple model class for a fictitious data source we will load up into a context attribute from a context parameter within the DD. Our simple servlet will replace and delete this DD so you can see the various ServletContextAttribute getting invoked. We will also output console messages so we can see where in the application lifecycle the ServletContextListener events are fired. The first thing we are going to do in our setup is to make a base folder called _ServletsAdv in the root directory of our hard drive which we can put all web applications for this section into. click the Folder option and call the folder _ServletsAdv and press enter. Within the contextlisteners folder we will create separate folders to hold our DD, source files and our compiled byte code and these will be called dd, src and classes. Within the src folder create two subfolders called controller and model. The DataSource class is just a simple class that holds a file name and uses the JavaBeans standard of get<someProperty> and set<someProperty>. For a refresher on JavaBeans you can look at the Java5 Tutor website and in particular the section on Getters & Setters. Cut and paste the following code into your text editor and save it in the c:\_ServletsAdv\contextlisteners\src\model directory as DataSource.java. Compile DataSource.java using the java compiler with the -cp and -d options as below, making sure you change apache-tomcat-6.0.37 to wherever you downloaded Tomcat to. The following screenshot shows that we get a clean compile and also the DataSource class now compiled into the classes\model directory. We are now ready to code our listeners and we will code the ServletContextListener implementation first. The ImplServletContextListener class implements the contextInitialized() and contextDestroyed() methods of the ServletContextListener interface. We extract the context initialisation parameter and create a DataSource object from the context. We also create a context attribute containing the create DataSource object and output a few simple messages to the console. Cut and paste following code into your text editor and save in the c:\_ServletsAdv\contextlisteners\src\controller directory as ImplServletContextListener.java. Compile ImplServletContextListener.java using the java compiler with the -cp and -d options as below, making sure you change apache-tomcat-6.0.37 to wherever you downloaded Tomcat to. The following screenshot shows that we get a clean compile and also the ImplServletContextListener class now compiled into the classes\controller directory. Our second listener is for the implementation of the ServletContextAttributeListener interface. The ImplServletContextAttributeListener class implements the attributeAdded(), attributeRemoved() and attributeReplaced() methods of the ServletContextAttributeListener interface. We write the name of the context parameter and its old or new value to the console along with information about the method used. Cut and paste following code into your text editor and save in the c:\_ServletsAdv\contextlisteners\src\controller directory as ImplServletContextAttributeListener.java. System.out.println("Context attribute added. Name: " + attrName + " Value: "
System.out.println("Context attribute removed. Name: " + attrName + " Value: "
System.out.println("Context attribute replaced. Name: " + attrName + " Old value: "
The following screenshot shows that we get a clean compile and also the ImplServletContextAttributeListener class now compiled into the classes\controller directory. We are now ready to code up a simple servlet that gets the DataSource created in the ImplServletContextListener listener implementation and to also make sure our ImplServletContextAttributeListener writes out messages on context attribute change events. 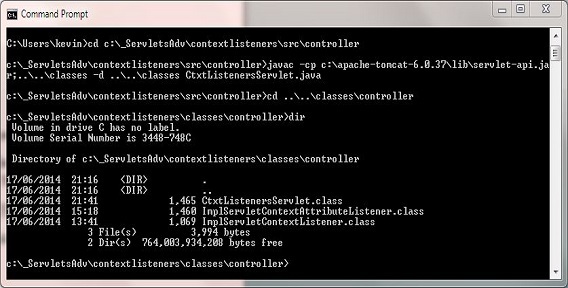 Compile CtxtListenersServlet.java using the java compiler with the -cp and -d options as below, making sure you change apache-tomcat-6.0.37 to wherever you downloaded Tomcat to. The following screenshot shows that we get a clean compile and also the CtxtListenersServlet class now compiled into the classes\controller directory. This DD has a new element we haven't seen before, the <listener> top-level element. The top-level <listener> element is optional and can appear in the DD mutiple times. Within <listener>, the <listener-class> sub-level element is optional, can only appear once and represents the fully qualifed name of the listener class. There is no need to state which kind of listener is being used as the web container works this out using the Java Reflection API, which is beyond the scope of these tutorials. The listeners are called in top-down order which may be of importance if you have more than one listener class implementing the same interface and care about invocation order. On shutdown the order is reversed, so you can think of it as a Last-In-First-Out (LIFO) sequence. 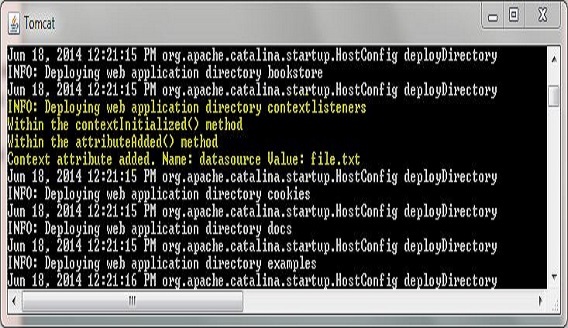 Within the contextlisteners folder create the WEB-INF folder. Ok we should see some entries in the Tomcat 6 logs on deployment as we added listeners for context initialisation and we also added a new context attribute. These listeners are for the application and will be invoked before any servlets are initialised. The following screenshot shows the System.out.println messages we sent to the console, which appear in Tomcat 6 server window. I have highlighted the relevant lines in yellow so you can see them easier. For application startup via the implemented ServletContextListener. For adding a context attribute via the implemented ServletContextAttributeListener. The web browser should be directed to the CtxtListenersServlet servlet class within Tomcat and execute. We won't see a web page as we didn't render any HTML tags, but we should see some new entries in the Tomcat 6 logs (at the bottom) as we added listeners for context attribute replacement and removal. The following screenshot shows the System.out.println messages we sent to the console from the CtxtListenersServlet servlet, which appear in the Tomcat 6 server window. I have highlighted the relevant lines in yellow so you can see them easier. As you can see from the two screenshots above we took a context initialisation parameter and created a DataSource object from it, which we then used to create a context attribute. All this was achieved at application deployment via our implemented listeners before any servlets had run. Using declarative programming in this way enables us to change entities within our web applications via the DD without having to alter any servlet code. In this lesson we looked at context listeners and some uses for them. In the next lesson we look at request listeners, their event types and how to use them.